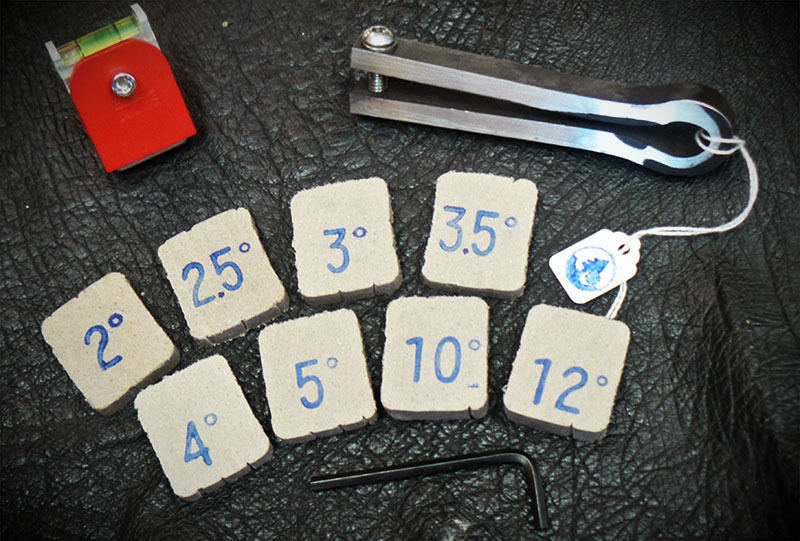 "This jig is well worth the investment when you see your final results. I used mine for about 6 blades and put it aside for few more grinds, but didn't take me long to go back to using it." Welcome to the home of the Flat-Grinder's Bubble Jig! "...a shameless plug for my new favorite knife making item. Check out Fred Rowe's [B]ubble [J]ig. I passed it over when I first saw the thread about them but after making a couple knives I though that might be handy to have. Well, I used it and am a complete convert. I can't image (sic) doing a flat grind without it now. I suggest his clamp as well. I should have gotten it with my bubble jig but didn't. Now I'm deciding if I want to make my own plunge line guide or just order his. It's an elegant design I can't easily duplicate, and all the other solutions I've thought of have been far less simple and don't look like they'll be as effective." "I just wanted to say that I received the jig and was able to use it 'expertly' from the first knife forward right out of the package. The motion of holding the knife is very much so the same as what I normally do when I grind. it. But [The Bubble Jig] has given me a no fault and zeroed in grind that takes most of the educated guess work out of the process. I have to admit I was very skeptical as I have been free hand grinding knives and tools for 25 years and many "gadgets" simply get in the way of grinding or are one trick ponies that do not allow any freehand grinding freedom. This definitely is not a gadget, but a well thought out flexible precision tool. Needless to say I'm VERY impressed with the product! And you were correct, it cut my grinding time by half. This was definitely the quality control tool I was looking for, with added plus if being a time saver. Thank you very much for offering this product." "Fred's jig is a great invention for sure. Many uses for these other than knifemaking. I'm glad that Fred is getting positive feedback as these jigs are well worth the money." "I highly recommend the one and only Bubble Jig. For real it is great! Thanks Fred!" "I received Fred's Bubble Jig and tried it out on a blank I had in the garage today. Well, I must have watched his video clip a hundred times, and boy has it improved my bevel grind to no end! By some freak of luck, I have had the natural gift of doing bevels by hand without any tools, but this Bubble Jig has given me the ease and confidence to carry on, and in time, this will reduce any possible mishaps with free hand. I strongly recommend to all to give it a try, if you are setting off on this fascinating art." 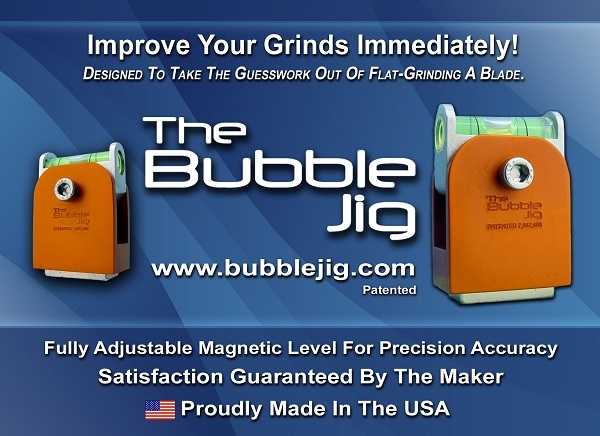 "Your incredibly clever Bubble Jigs are a huge hit in our grinding room! Thanks for such a great product!" Thanks for a great help on one of the most aggravating parts of knifemaking." "I have several woodworking jigs I never use because they are a pain in the arse. [Fred's] jig is just too easy not to use."